Whether they’ve already been drafted into the Ontario Hockey League (OHL) or retiring to rec hockey next season, the Midget “AAA” All-Star Game provides players a unique opportunity to exercise their skill set against the best talent in their age group. 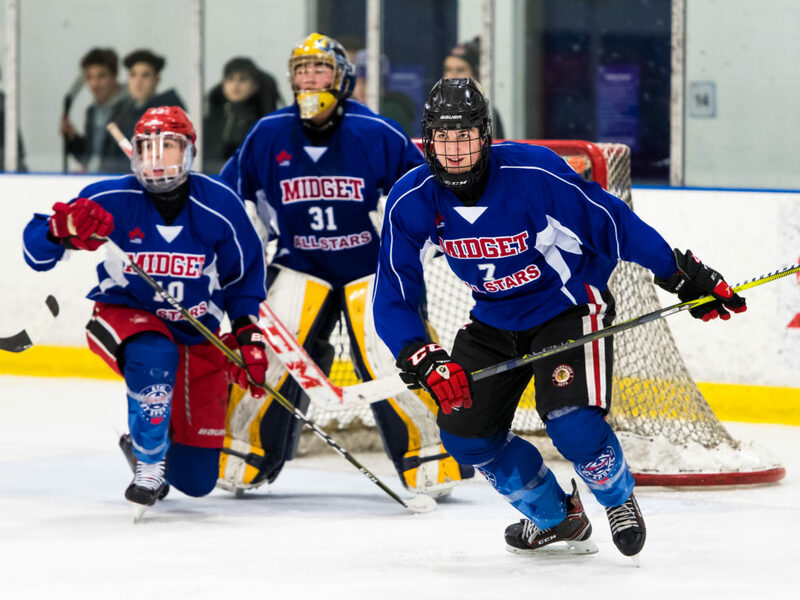 “Though my team is doing well this season and is quite talented, it will be a great experience to play with the top players and compare the difference in the quality of hockey,” explained Deacon Holmes, a defenceman with the second place Mississauga Rebels. The 18th annual rendition of the event will take place on December 18 at 7:30 pm at Scotiabank Pond and will feature 42 of the top players from the Midget “AAA” loop. Nine players participating in the game were selected at the 2018 OHL Priority Selection in the spring, while others will aim to be chosen at the OHL U18 Priority Selection. Five players from last year’s Midget “AAA” All-Star Game were selected in the 2018 OHL U18 Draft. O’Toole is one of five players from the Mississauga Rebels who will partake in Tuesday’s game. The Jr. Canadiens and first place Toronto Young Nationals also have five players each. Players from all 12 Midget “AAA” clubs are represented on the roster. “What I’m most looking forward to about the game is to be able to play with and against some of the best players in the age group and see how I stack up against them,” said Owen Saye of the Don Mills Flyers. The Flyers are currently tied for second with the Mississauga Rebels. Only three points currently separate the top four teams in the Midget “AAA” loop – all of them battling to make it to the Telus Cup. Admission to the Midget “AAA” All-Star Game is free of charge. The game will be streamed live at gthl.gameonstream.com.